Free Math Games For Kids Are Exciting And They Make Learning Math Lots Of Fun! "Learn Division the Fun Way"
Kids just wanna have fun. So when it comes to learning math, free math games for kids are pretty cool! Games help make learning more enjoyable. And if it’s enjoyable, we won’t have any problem getting them to learn math. Object of the game: Be the first player to reach the finish line by recognizing correct and incorrect answers. 1. All players place their game piece on START. Players roll the die, and the person with the highest number begins the game. 2. The first player rolls the die and moves forward that number of spaces. Then he reads the line that matches the number he rolled. 4. Someone else checks his answer with the calculator. If the player is correct, he stays on that space until his next turn. If he is incorrect, he goes back to the space where he began the turn, and that turn is over. 5. Each player follows in the same manner. 6. The game ends when one player reaches END with an exact roll of the die or from a line of instructions. Maybe your child or class is a little bit rusty with those division facts. No need to worry, we've got that taken care of too! Here's a game they will enjoy that will build their division fact skills. If multiplication is a skill that needs a little tweaking, our multiplication activities are fun and easy for kids to get hooked on too! This one is for multiplication facts. Or maybe you looking for a game for multiplying larger numbers. Math is a very important skill, one which all students will need for the future in our technological world. We should encourage our children to think of themselves as mathematicians who can reason and solve problems. The free math games for kids we provide on this site are a great way to reinforce skills taught in the classroom. With the many games to choose from, students can be involved in selecting which games they would like to play. This gives them a sense of ownership of the games. There are math games for just about every math concept kids learn in school. Students can also play the games with their parents. Parents will enjoy this as it gives an opportunity to help your child an be involved with what your child is doing at school. 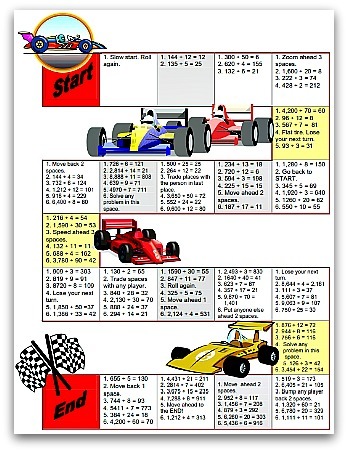 There are free online math games and also printable games. Want some more 4th Grade Math Games. Or you can go check out some more 5th Grade Math Games. The great thing is that these are free math games for kids.